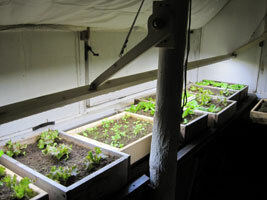 Our attached greenhouse has been an integral part of our house from the beginning; a very important part it is, too. 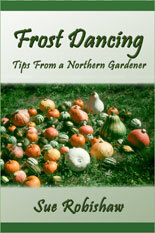 It's wonderful for starting plants in the spring and for growing green things when the garden is frozen and under snow. But equally appreciated is the aesthetic joy it gives us in the winter, standing in the shop area looking into this cozy room full of green growing plants while outside winter is in full swing. It brightens our day far beyond the harvest of salad and cooking greens, though we certainly like and appreciate those, too! 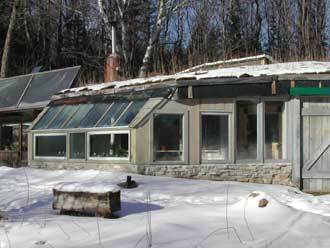 Our house was finished in 1985, with the first version of the greenhouse. In 1999 we did a major rebuild which made a much warmer, tighter, and nicer space. There are a few photos of the rebuild here. I do love my greenhouse! It's active and full from fall through spring, then it sits quietly through the summer as my attention turns outside. Following are some posts from our Blog page that highlight activity through the season. One day I'll organize this page to make for easier browsing and reading, but for now I hope you enjoy the mini-tour. 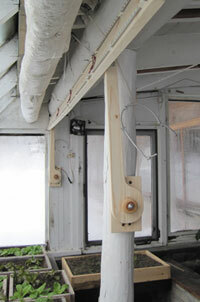 With gale force winds, rain, then frosts and freezes in the 20's, it was time to move plants into the greenhouse. I don't think they minded, and we love to have the greenhouse come alive with an instant garden right outside the shop window. 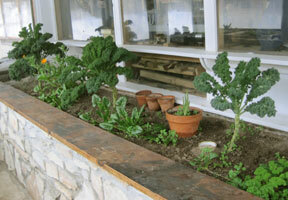 Some full size plants are dug from the garden (kale and parsley) to add to our meals through the winter. I also brought in most of the sweet pepper (Red Belgium) plants since there are still many ripening fruit. Frosts came early and ripening was later this year. They seem to be settling in nicely. 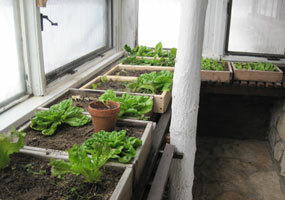 Many flats were planted with lettuce and spinach a month or two earlier and have been growing well, waiting in the garden for the move west into a warmer climate for the winter. I'll still be harvesting lettuce and spinach from the garden (protected in cold frames now) until things get covered in snow. 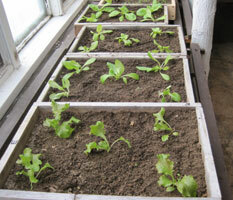 But later these flat plants will provide salad greens all winter. A few flowers (marigold, calendula, nasturtium) brighten up the mix, and I'll soon plant a handful of daffodil bulbs for late winter cheer. So we're happily all nestled into our cozy valley and enjoying the change from yellow-gold-red leaves in the trees to a carpet of the same on the ground. We'd still like a few more days of "good" weather for last minute out door chores (always!) but the wood shed is full and the garden almost ready for winter so we can enjoy the weather whatever it does. 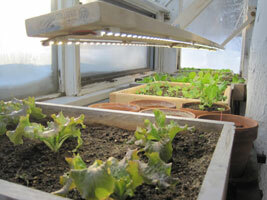 So how did the LED lights work out in the greenhouse, and the "regular" LED light for the herb/flower seedlings in the house (see February 5 post)? We didn't know if there would be enough light to be worthwhile to help the plants grow more and greener since these weren't "grow lights", just regular white lights. In the greenhouse they are supplements to the sunlight--turned on for a few hours morning and evenings, and during the day on cloudy days. 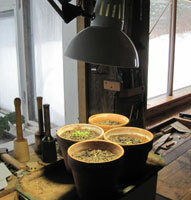 The seedling light (just one of the regular shop lights) inside was on the plants all day, except on sunny days when the greenhouse was warm (above 50) when I'd put the little seedlings out there for some real sunshine (well, through the window sunshine). Now, a month later--they all did great. 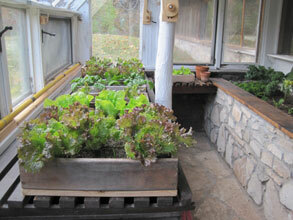 The lettuce and greens in the GH grew faster and were the healthiest and stockiest I've ever had this time of year. We've been enjoying salads every day. 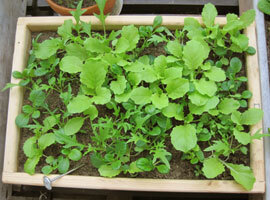 And the herb and flower seedlings also did well. I just potted most of them up into their own 3" pots. I normally wouldn't try to start seeds so early because of the lack of light and the cold GH. But these got their own light and in the comfort of the warm house. Next year the GH bed will get a light bar as well and I'll be able to grow more early greens there, probably spinach which will appreciate the deeper soil. All in all, we're all happy with the project! Our house lighting is entirely LED (except for one lone compact fluorescent holdout). Steve has been building and adding LED lights to the house since the early days of LED lighting, when making your own lights was about the only way to have them, and the choices were few and expensive. Forward a few years and LED lighting is now not only readily available but popular and inexpensive! Technology moves fast. Could we now consider adding lights to the greenhouse? 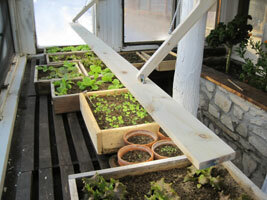 Our PV system is larger, and we truly want fresh, and abundant, greens in our salads. So before Steve was quite done with the Array-Cam project, he was checking out, ordering, designing, building lights for the greenhouse. But what type? What colors How many? Will they be worth it? I did a bit of research and it was rather overwhelming. I arbitrarily decided our greens didn’t need the in-depth scientific approach that most articles provided (almost all for commercial farm and marijuana greenhouses). We tried an experiment, putting a flat of just started growing greens (which were already getting a little leggy from the minimal light available in the greenhouse) and some pots of just germinated herbs and flowers under two of the regular LED lights in the shop, morning and evening for about 2 hrs each. After a week I could see a positive difference in the flat of greens (the others were too young yet but I figure it likely helped them, too). OK! Let’s go. 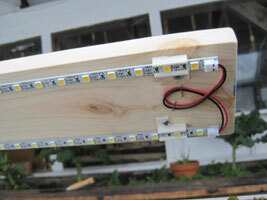 Steve had some strips of warm-white LED’s on hand and ordered more strips of cool-whites (more light in these). We decided this would do and be more flexible down the road. We might some day add red and blue but for now this is what we have -- two stripes of LED lights seven feet long. That almost covers the length of the front bench. With some fancy design/build the light bar can be moved up out of the way during the day and to be able to remove/install the insulating window panels at night. For about 2 hrs in the morning and in the evening they are on, extending the day for the plants. I’m really happy to have this latest upgrade to the greenhouse, and I think the plants are, too! Sub zero temps outside but cheery inside! When it's this cold it also (usually) means clear sunny days and beautiful brisk starry nights. The solar heating panels and south facing windows pour in the heat (in a winter moderate way) so we bank the woodstove and don't have to get it going again until the sun goes down. And the PV system is at its highest with clear sun and reflective snow. The batteries are full and we turn on small heaters to make use of the extra power. And that calendula in the greenhouse breaks out the blooms to celebrate. Actually, the calendula has been happily blooming in the greenhouse since soon after I transplanted it from the garden in October, a rooted side shoot of a summer growing plant. It's wonderfully tolerant and is content to blossom whether it's winter or summer, inside or out, as long as its basic needs are met--sunshine, moderate moisture, no deep freezes. It thankfully does not have high demands. That's why it's one of my favorite flowers. A hardy annual it can handle some frost; is easy to grow; self sows readily; is a sturdy plant that gets along well with others. And it blooms and blooms and blooms as long as you keep the spent blossoms picked off. 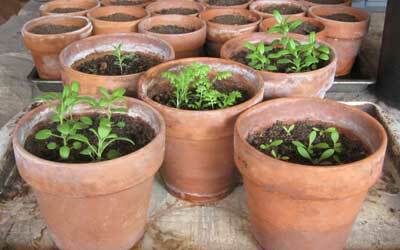 Though towards the end of summer you have to leave some to mature seeds so it can provide plants next year. Mine is a common variety - Pacific Beauty Mix - nice gold/yellow blossoms. I like it. It's been self sowing in my garden for so long I've forgotten when I first planted the seed. But I noticed this year that I didn't have many plants coming up, the downside of having a very good mulch that sometimes mulches out seeds I want to grow. And I found I had neglected to harvest any seed, I was so used to it sowing itself. 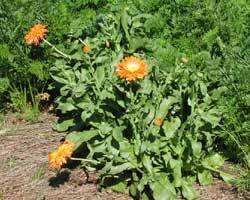 Now, I expect they'll be some calendula popping up somewhere next year, they don't give up that easily, but just to be sure I bought new seed. I think I'll plant a few inside right now so maybe I'll have some extra early fresh blooms in the spring. The plants I dig up from the garden do sometimes get a bit tired by late winter. It's a little cold in the greenhouse right now, it was down to 32 degrees this morning after a ten below night, but it gets up in the low 50's during a sunny day. Everything growing out there is hardy so I don't worry about the low temps but I'll start the seed inside the house to give it a warm start. We all enjoy that sunshine when it happens but it's those cloudy days outside that the fresh green plants and bright calendula flowers growing in the greenhouse really brighten our winter days. Well, maybe not a lot of activity but it warmed up outside today to 20 deg. and we're supposed to have a few days of these warm temperatures (and finally some real snow showers, too!) (we only have about 8-10" right now) so I figured this was my chance to transplant the waiting lettuce seedlings into the recently cleared (by eating) flats. Not much growth is happening yet but I'd like these to be ready when the days get longer and things pick up. And it was a pleasant (relatively speaking) 47 degrees inside. So we now have 8 flats of greenhouse lettuce -- Brown Winter, Salina, Red Tinged, Diamante -- ready to grow when the conditions are right. And since we're getting down to real slim pickings with what is left of the older crop we'll be quite ready, too. It was fun to dig in the dirt again, even if in a small way. In the winter we move to eating out of the greenhouse instead of the garden. Not only is it great to see growing green things when it is white and freezing outside, it's great to have fresh greens to eat! In the summer the greenhouse is empty of plants and is our heat loving Sasha cat's domain. But come October it comes to life once again. 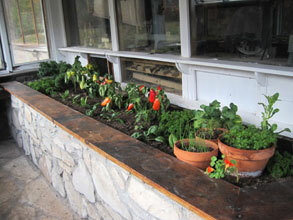 This is how it looked Oct. 20 when first moved in from the garden where they had been growing. 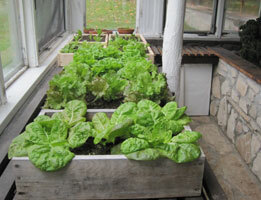 In the short days of fall and early winter there is not much growth so I start lettuce and spinach in the garden, then move the full grown plants inside when the real freezes start outside. Full grown plants of kale and parsley and others are dug and transplanted into the waist high bed along the house side of the greenhouse. This works great. I can harvest from them all winter. There most often is little growth until January when the days start getting significantly longer and there is (usually) more sun. But this year it was oddly warm and sunny in Nov. & Dec. So the lettuce in particular just kept growing. It got to be quite a jungle and there was plenty for luncheon salads. But 70 days later you can see it is getting a bit sparse. So I'm lookin g forward to the coming flush of January growth. In the far end are two flats of small lettuce seedlings waiting to be transplanted to the larger flats as the older plants are removed. They will be our salads later in the winter.